Christmas Card Litho – Christmas card from Lion Brewery after they acquired the Stegmaier rights when the brewery closed in 1974. 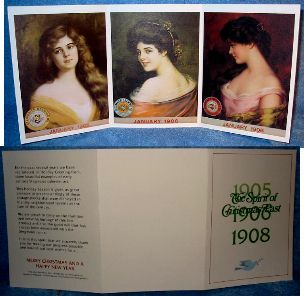 A reproduction of the 1905, 1906 & 1907 Stegmaier lady lithos. This is a 3-panel fold card in super shape. Each panel measures 5 1/4 x 7 inches. Each of these ladies was issued in a separate large card. A good “go with” if you have the individual cards.